For anyone who has made the choice to explore the field of network marketing, Multi-level marketing is a business model that will always present itself as a potential money making opportunity. For newcomers in this particular field, there is often an unfortunate association between multi-level marketing and the pyramid scheme. While the two business models may seem similar on many levels, the difference is evident upon close examination. There are several inherent flaws in any pyramid scheme, the first one being there is absolutely no end benefit. Without the transfer of products or services, there is only an exchange of money in the form of membership fees. Understandably, the second flaw is that there is only one direction money can travel in this business model, and that is “up the chain.” The creator of the pyramid, and a select few who are directly involved in the top level, are the only members who will ever see any significant compensation. This brings us the third and final flaw. Simple mathematics. The exponential growth of the pyramid makes it increasingly difficult, and ultimately impossible, for members to generate any income. 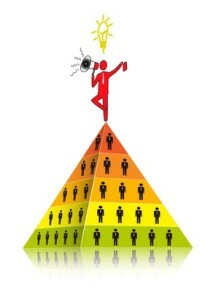 The bottom of the pyramid becomes filled with members who are unable to recruit, and are unable to earn. With no product or service to provide, the pyramid collapses. This is the unsustainable nature of the pyramid scheme. Although there is a great deal of confusion about what separates the pyramid scheme from the MLM business model, there are some very fundamental differences, the most obvious being that a multi-level marketing program offers legitimate value to customers in the form of tangible goods and services. Because multi-level marketing programs are able to offer products to prospective customers, associates are able to generate income through direct sales, rather than through the sale of additional membership opportunities within the program. This essentially offers associates in an MLM two distinct ways to generate income; Commissions through sales of the product, and commissions from building membership in their own downline. 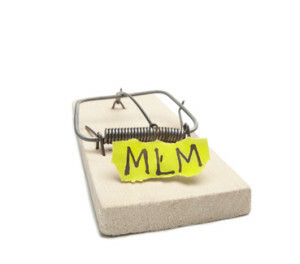 Unlike a pyramid scheme, the structure of a multi-level marketing program makes it possible for members to make an income regardless of their position in the powerline, or “chain.” This means that as an associate or member in an MLM, there is no restriction in the compensation plan that prohibits someone from making a higher income than the member who originally recruited them into his or her downline. Without experience and a solid understanding of the differences between a pyramid scheme and an MLM, newcomers need to pay close attention to any program that might catch their eye. It’s important to take a close look at the nuts and bolts of an offer in order to make an informed decision. It’s time to ignore the pitch, and see what’s behind the curtain. A legitimate MLM will have no issues laying their cards on the table. This means a complete description of their products and services, a full explanation of their compensation plan, and income disclosures that will give you a clear idea of just how accurate their testimonials might be. The originators of a pyramid scheme will be very vague about the existence of products or services, and they will be very insistent about receiving an upfront membership fee before disclosing information that should always be readily available to prospective members. They will also go to great lengths to convince you they are not promoting a pyramid scheme. Network marketing has been around for thousands of years, and pyramid schemes and legitimate MLM programs are not restricted to the Internet. If you are concerned with the differences however, chances are you have an interest in making money online. Education and training is your best line of defense. Before investing money in any online business opportunity, it’s important that you take the time to learn the fundamentals. 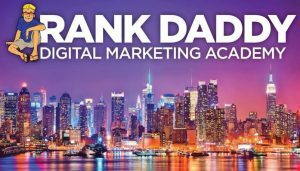 Any form of marketing strategy is a business, and your success begins with training.